Newton Stewart RFC made the long but scenic trip away to Oban last weekend, to face a side who have been forced to postpone several matches due to an unplayable pitch, but who have had a relatively successful season in the games they have played. 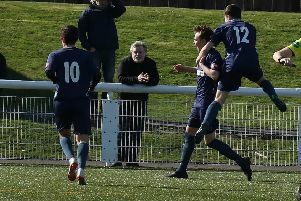 Currently sitting fourth in the league, two places behind Newton Stewart, Oban are always dangerous on their home turf and the Reds knew they would have their work cut out. Oban kicked off and the visitors quickly gathered the ball before immediately coming on the attack. Early line breaks by flanker Mark McCornick, back row James Wallace and winger Hamish McGeoch, a regular player for Wigtownshire RFC, put the Oban defensive line under some pressure. Keeping their cool however, Oban countered with a good kick from deep to clear the ball. After ten minutes Newton Stewart were awarded a penalty for an Oban infringement. Centre David Sommerville kicked to touch and the resulting line-out gave the Reds an opportunity to attack again. They pressed forwards, however an unfortunate knock-on at the back of a ruck halted their progress once more. A spell of fairly even play followed with Newton Stewart showing their prowess at the breakdown and Oban kicking into the corner at every opportunity. Full back Tyrell Wilson gathered the ball well when it came his way and demonstrated some excellent counter-running. The middle phase of the first half saw Oban exert some serious pressure on their visitors. The heavier home pack dominated the scrums and coupled with some good direct running they began to push the Newton Stewart defences backwards. The Reds defence was valiant, managing to hold up a ball on the line initially, however a strong scrum from the Oban forwards close to the line eventually resulted in a try. The conversion went awry, 5-0. After the restart the Oban onslaught continued. Newton Stewart struggled to get possession with their scrum under so much pressure. Five minutes after the first try, another followed for the home team when their stand-off cut through the stretched Newton Stewart defence to score. This time the conversion followed and the deficit was extended to 12-0. With ten minutes left to play in the first half, Newton Stewart began to find some rhythm. Moving the ball wide they looked dangerous and started to threaten their opposition defence. A penalty was awarded to the Reds well within kicking distance, however an unusual miss from Sommerville left the gap as before. With the minutes ticking down towards half-time, Newton Stewart maintained their pressure. Scrum half Robbie McCornick kicked a nice ball through the defence which brother Mark collected going forward. A neat off-load to winger Fraser Morton allowed the latter to cross the line unopposed to score between the posts. An easy conversion followed from Sommerville and the score at the interval was 12-7. Soon after the restart, stand-off Jamie Muir made a good break and chipped through the defence. A penalty was awarded to the Reds and a kick to touch gave them a line-out five metres from the Oban try line. The ball was spun wide from the line-out and Morton stepped inside two defenders to score his second try of the match. The conversion attempt once again went wide from Sommerville leaving the scores all square at 12-12. The next twenty minutes were dominated by the huge Oban forwards once again. The home team stopped kicking their possession away now and instead kept the ball in hand; their number 18 in particular making some big yards. The Reds’ defence were forced to make a lot of tackles and they held up well as they have done all season. With nine minutes left on the clock, a penalty was awarded to Newton Stewart on the Oban twenty-two yard line. Muir stepped forward to take this one and made a good connection to allow the visitors the lead for the first time in the game. Oban clearly felt frustrated at going behind in a game they had been so dominant in, and came on the attack once again. Two scrums resulted, back-to-back, on the Newton Stewart five metre line. This time the defensive push was massive and the Reds showed great resilience, refusing to give up their lead. With the last couple of minutes to play, Oban were awarded another scrum well into their opponents’ territory. Newton Stewart were defending for their lives now and Mark McCornick in particular defied the laws of physics to drive a twenty stone Oban prop back ten yards. The pressure from the attacking team was relentless, but the defence withstood it all and the game finished with Newton Stewart three points to the good. This was a very physical game, with the Oban team probably deserving to win but Newton Stewart holding out for a great moral victory. The defensive effort of the whole team was impressive; the front row doing incredibly well in the absence of two of the regular line up. Thomas MacDonald and William McCornick moved in from the second row to fill the gap, but with the opposition some of the strongest the team will face all season, this was no easy task. Special mention to winger Fraser Morton for scoring two good tries in this game, however man of the match this week had to be Mark McCornick. Always a committed tackler, a strong ball carrier and a nuisance at the breakdown he is a key player for a Newton Stewart every week. His tackling in this game was exceptional however and vital in the dying stages to exact the win. This weekend is the return leg of this game, with Oban making the long journey down to Bladnoch Park. Kick-off is at 3pm.